[Video Tutorial] These Fancy Mary Jane Slippers Are Amazing! Simple, fun and functional, this bag is perfect for any season! The Plupp Bag by Kanelsnackan makes a beautiful gift for you or someone else. The pattern can be easily done in two or more colors and can be adapted to complement your style and personality. This crochet project uses fairly simple stitches that create a gorgeous pattern with lots of texture. After a few rows, which can feel tricky, it’ll be a quick and easy project. 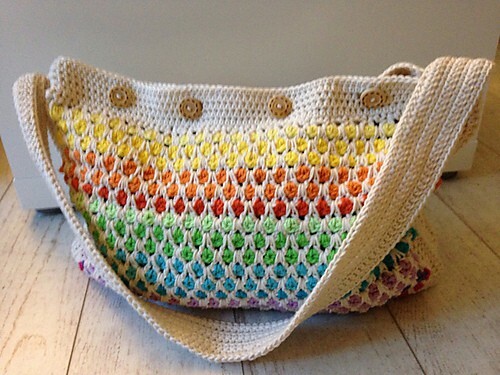 You can make this bag in as many or few colors as you like (but at least two). Size is about Height: 12” / 30cm Width: 15.5” / 40cm using aran weight yarn and a 3.5mm hook. But you can use other yarn and/or hook, but that will affect the size of the final item. Cotton yarn is prefered. I used 300g-400g for the sample bag. Pattern includes written instructions and a simple chart. Thanks to Kanelsnackan for the article inspiration and featured image. 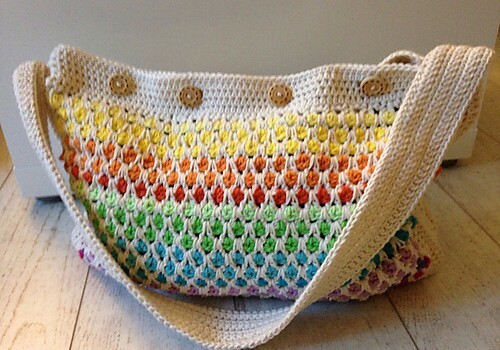 [Free Pattern] This Bag Pattern Loaded With Bohemian Charm Can Be Done In Just A Few Hours. How long will it take for you to make this for me Deb? Marlene, you should make yourself this! So pretty! With all the you tube video now should be easy to teach yourself to crochet. I have to stick to small projects myself. I know it says free pattern, but, if you go to page, the pattern costs $5.00! Am I missing something?